Patients in nursing homes are at risk of adverse events, representing a highly vulnerable group that is chronically weak and cognitively or physically reduced. To prevent adverse events, knowledge of patient safety culture can act as a basis for nursing homes’ own organizational improvement initiatives. There is scarcity of longitudinal studies exploring the sustainability or variability of safety culture in nursing homes. This study therefore describes the variability in staff perceptions of patient safety culture over time in a cross-sectional sample of Norwegian nursing homes, and tests the influence of nursing homes’ own organizational initiatives. The study applied a cross-sectional and prospective longitudinal design collecting data on staff perceptions of patient safety culture in nine Norwegian nursing homes based on the Norwegian version of the Nursing Home Survey on Patient Safety Culture (NHSOPSC) instrument. Data collection took place through a baseline survey (June–September 2013) and through a follow-up survey (March–April 2015). Data were analyzed by descriptive statistics, t-test, and hierarchical regression analysis. The response rate was 70% at baseline and 69% at follow-up. Variability, measured by changes in the average percentage of positive responses per safety culture dimension, showed a high degree of stability for the nine nursing homes in total with more variability across each single nursing home. When comparing mean scores for the total patient safety culture score, only one of the nursing homes improved significantly from the baseline to the follow-up. After adjusting for the facility level (single nursing home), nursing homes’ own organizational initiatives explained 29.5% of the variance in the total patient safety culture score (F [4, 263] = 27.53, p < 0.001). Our results demonstrate that patient safety culture is relatively stable in the Norwegian sample of nursing homes over a 20-month period. Our findings indicate that organizational initiatives tailored to local needs are predictors for the total patient safety culture score. Furthermore, there is a need for an extensive and sustained level of effort as only one nursing home (NH6) showed a significant improvement in the total patient safety culture score. In this study, we describe variability in staff perceptions of patient safety culture in Norwegian nursing homes over time and examine whether nursing homes’ own organizational initiatives influence the patient safety culture. Patients in nursing homes are at risk of adverse events, as they represent a highly vulnerable population that is chronically weak and cognitively or physically reduced . Healthcare-associated infections, e.g., catheter-associated urinary tract infections, and medication-related events are common in long-term care (LTC) settings [2–7]. Despite this vulnerability among nursing home patients, most of the patient safety research has so far focused on hospital settings as reflected in the literature [8–12]. Literature regarding patient safety issues in primary care  and LTC settings and especially in nursing homes is currently emerging [14–19], yet there is an urgent need for more studies in diverse contexts. Some current studies indicate that a positive patient safety culture is associated with patient safety outcomes such as reports of falls and restraint use, though the findings are not consistent [14–16]. In a recent study of staff perceptions of patient safety culture in Norwegian nursing homes, we found a positive awareness of patient safety culture among frontline staff together with an established confidence in nursing managers’ attention to patient safety issues . Several survey instruments for patient safety culture are available for use in nursing home settings. Among them are the Nursing Home Survey on Patient Safety Culture (NHSOPSC) and adapted versions of the Safety Attitude Questionnaire (SAQ) [18–20]. Safety culture can be considered a part of the “inner” context of an organization [21, 22]. This is in line with the following definition: “The safety culture of an organization is the product of individual and group values, attitudes, perceptions, competencies, and patterns of behavior that determine the commitment to, and the style and proficiency of, an organization’s health and safety management”  p.23. A dimensional concept analysis of patient safety culture in nursing identified key determinants such as management commitment, immediate supervisor attention, shared values, individual behavioral factors, and reporting systems . Nurse managers are identified as key actors in improving communication and decision-making concerning patient safety . Fear of reporting adverse events has furthermore been recognized as an important barrier to patient safety improvement in nursing homes . What is the variability over time in staff perceptions of patient safety culture in a cross-sectional sample of Norwegian nursing homes measured by the NHSOPSC instrument? 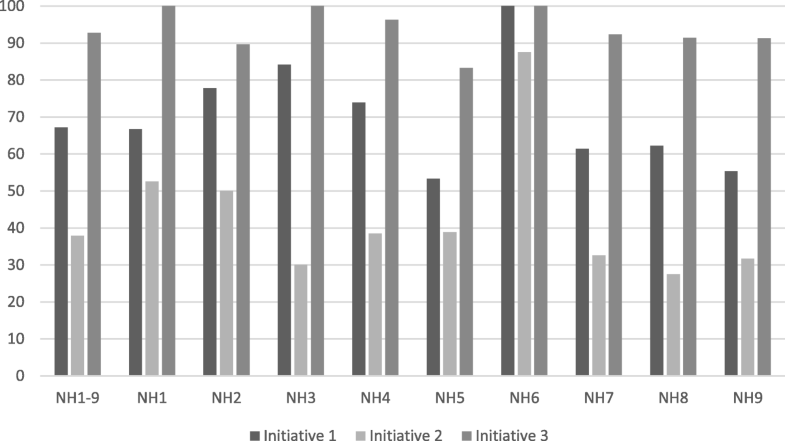 What is the influence of nursing homes’ own organizational initiatives on staff perceptions of the total patient safety culture score in the sample of Norwegian nursing homes? The study applies a cross-sectional and prospective longitudinal design, collecting data pertaining to staff perceptions of patient safety culture in nine Norwegian nursing homes using the Norwegian version of the NHSOPSC instrument. Data collection took place at baseline (June–September 2013) and was repeated during a follow-up after 20 months (March–April 2015). Nursing homes play a critical role in the Norwegian healthcare system with increased responsibilities and tasks defined by the Norwegian Coordination Reform as of 2012 . The underlying challenges that motivated the Coordination Reform are also found in other Nordic countries and European countries like the UK and the Netherlands where similar reforms have been introduced . Consequently, older patients with chronic illnesses who are in need of medical treatment and nursing care are transferred from hospitals to nursing homes [27, 29]. As part of the Coordination Reform, financial incentives were introduced, including raising the daily fee if municipalities are not able to receive patients “ready for discharge” from hospitals . This led to an increase of 260% in the number of patients classified as “ready for discharge” during the period from 2011 to 2014 [30, 31]. The Norwegian Patients Safety Campaign was launched in 2011. It was followed up by the Patient Safety Program in 2014 with a stronger emphasis on patient safety in the LTC setting including in nursing homes . In 2016, 64% of the municipalities participated in the government-initiated Norwegian Patient Safety Program . The program focuses on leadership commitment to support patient safety initiatives together with specific improvement measures such as medication reconciliation and early recognition of deteriorating patients . Data were collected in six municipalities in the southern part of Norway, including both urban and rural districts. The sample was purposely selected and included nine nursing homes of different sizes and care types (Table 1). Long- and short-term care, subacute and acute care, rehabilitation, care for patients with cognitive impairment, and palliative care were included. The organization and “day to day activities” of the included nursing homes differed according to size and geographical location and with the level of integration with daycare and home-based care services. Some of the nursing homes (NH2, NH3, and NH8) had undergone organizational changes such as the downscaling of beds in the period 2013–2015. The study included staff, defined as healthcare workers, with a minimum of 30% job position and who were able to read and understand the Norwegian language. Due to geography, size, and local circumstances, the nursing homes differed according to the management levels represented in the sample. Patient safety culture was measured with the Norwegian version of the NHSOPSC instrument, which consists of items covering the perceptions of healthcare staff about patient safety culture. In previous psychometric testing, we documented that a 10-factor model including 41 items showed an acceptable fit in the Norwegian setting . All NHSOPSC items are rated on Likert scales from 1 to 5, in addition to a response alternative “does not apply” (DA) or “do not know” (DK). The instrument included two overall rating questions, considered as outcomes. One item was formulated as the statement, “I would tell friends that this is a safe nursing home for their family” (yes, maybe, no), and the other was formulated to request a graded rating, “Please give this nursing home an overall rating on patient safety” (scale from 1 to 5). The survey also comprised demographic variables, including staff position and background, number of years in the nursing home, work-hours per week, work-shift, and whether staff normally worked directly with patients [18, 33]. Three items regarding the nursing homes’ own organizational initiatives pertaining to patient safety were included in the questionnaire for the follow-up measurement (2015) as follows: (1) “In this nursing home, we have implemented measures to improve patient safety over the last year,” (2) “In this nursing home, we have been offered training to improve patient safety over the last year,” and (3) “I am familiar with the system for reporting of adverse events in this nursing home”. All items were answered on a 5-point scale (“strongly disagree,” “disagree,” “neither agree nor disagree,” “agree,” and “strongly agree”). An informational letter followed the questionnaires for the baseline and follow-up surveys and participation was based on written informed consent. Each nursing home had a contact person responsible for the local administration of paper-based questionnaires. The participating nursing homes were identified by an ID number on the questionnaires. In the current study, 548 questionnaires were distributed for the baseline measurement and 536 questionnaires for the follow-up measurement resulting in a response rate of respectively 70% for the baseline and 69% for the follow-up surveys. Feedback meetings were offered to nursing home managers as a follow-up from the baseline measurement. The nurse manager decided whom to take part in the meetings. The meetings included a presentation of structured results and an anonymized benchmarking with the other participating nursing homes. The objective of the meetings was primarily to provide managers with feedback on staff perceptions of patient safety culture. Reviewing the survey results and discussing potential areas of strengths and improvements together with the managers was another topic of the meetings. The results were presented according to the NHSOPSC survey manuals and materials, including the frequencies of responses for each survey item presented graphically [18, 34, 35]. The managers of each nursing home received a paper-copy of preliminary results and decided how to further present and use them within their organization. Structural equation modeling (SEM), with the means and variance adjusted weighted least square estimator, was used to test if the suggested 10-factor model fitted the Norwegian data. The results showed acceptable fit on baseline data (RMSEA = 0.060, 90% confidence interval (CI) 0.056–0.063, comparative fit index (CFI) = 0.935, Tucker-Lewis index (TLI) = 0.927, χ2 = 16,200.67, df = 820, p < .001) and follow-up data (RMSEA = 0.059, 90% CI 0.055–0.063, CFI = 0.936, TLI = 0.929, χ2 = 15,115.89, df = 820, p < .001). In previous Norwegian psychometric testing of this instrument, one of the original items B3, “we have all the information we need when patients are transferred from hospital,” was split into two items and later omitted from the final model due to low standardized factor loadings (0.158 and 0.345) . When including the original item in the follow-up data, the results showed a good model fit (RMSEA = 0.058, 90% CI 0.054–0.061, CFI = 0.936, TLI = 0.929, χ2 = 15,375.72, df = 861, p < .001), with an acceptable factor loading (0.419) for the original reinstated item B3, suggesting that this item should be included in future studies. However, in order to measure variability over time in the present study, the same 41 items will be used for baseline and follow-up survey data. When we examine the influence of nursing homes’ own organizational initiatives on staff perceptions of the total patient safety culture score, all 42 items will be used. The variability in staff perceptions of patient safety culture in the baseline and follow-up surveys was examined in three different ways. First, we described the average percent positive responses per patient safety culture dimension at the group level (all nine nursing homes; NH1–9) and facility level (single nursing home; NH1–NH9). The average percent positive responses for each safety culture dimension were calculated by averaging the item level percentage positive responses, excluding missing and DA or DK . The responses “strongly agree/agree” and “most of the time/always” for positively worded items or “strongly disagree/disagree” and “never/rarely” for negatively worded items were categorized as positive responses . Second, we examined the changes in the total patient safety culture score from the baseline to the follow-up at both the group and facility levels with independent sample t-tests. The total patient safety culture score was defined as the average of all 41 items in the NHSOPSC questionnaire. Thirdly, changes in the mean score differences from the baseline to the follow-up in the 10 safety culture dimensions were tested with independent sample t-tests at the group level (all nine nursing homes). Due to multiple testing, a more conservative significant level of p ≤ .01 was chosen for the analyses. The influence of the nursing homes’ own organizational initiatives on the staff’s perception of the total safety culture score (41 items) was examined in two ways. First, we presented percentages of respondents answering, “agree” and “strongly agree” on questions when excluding missing and DA or DK at the facility level (single nursing home). A multiple hierarchical regression analysis was then performed to analyze the predictive value of the initiatives. The facility level was entered in block 1 and the three independent variables (initiatives), rated on a 5-point scale, were entered in block 2. Correlations and preliminary analysis were conducted to ensure that there were no violations of the assumptions of multicollinearity, normality, or homoscedasticity before the regression analyses. No violations were found and the correlation coefficients varied between 0.140 and 0.524. The unstandardized coefficient (B), standard error of the mean (SE), and standardized beta coefficient (β) are presented. SPSS Version 24.0 (IBM Corporation, Armonk NY, USA) for Windows were used for all the analyses except the factor analyses that was performed with Mplus (version 7.2; Muthén and Muthén, Los Angeles, CA). At the baseline (2013), a total of 384 (70%) out of 548 healthcare staff from nine different nursing homes responded to the survey, while during the follow-up a total of 369 (69%) out of 536 healthcare staff from the same nine nursing homes responded. Demographic characteristics were quite similar in both the baseline and follow-up measurements (Table 2). Variability measured by changes in average percentage of positive responses per safety culture dimension from baseline to follow-up showed a high degree of stability at the group level (all nine nursing homes) (Table 3). Eight out of 10 patient safety culture dimensions had an average score of more than 60% positive responses both in the baseline and follow-up surveys. NH4 and NH6 reported higher average percent positive responses on all safety culture dimensions in the follow-up. Variability in the mean scores from the baseline to the follow-up for the total patient safety culture score (all 41 items) showed a significant difference at the facility level for one of the nursing homes (NH6) (Fig. 1). At the group level (NH1–9), there was no significant difference. 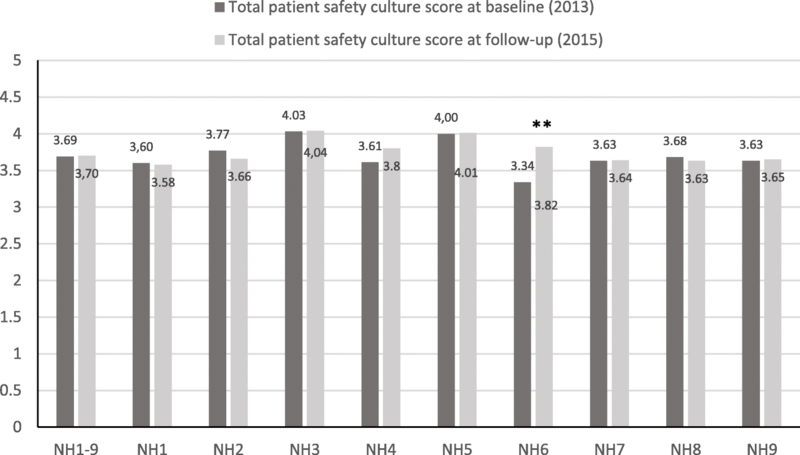 The results showed no significant differences between the baseline and follow-up surveys when comparing mean scores for each of the patient safety culture dimensions at the group level (Table 4). As some variability of patient safety culture existed across nursing homes, it was of interest to examine the influence of nursing homes’ own organizational initiatives. The results showed extensive variability in the level of organizational initiatives at the facility level, with one nursing home (NH6) having the highest scores on all three organizational initiatives (Fig. 2). Hierarchal multiple regression analyses showed that the variables “facility level” and “nursing homes’ own organizational initiatives carried out between baseline and follow-up” explained 29.5% of the variance in the total patient safety culture score (F [4, 263] = 27.53, p < 0.001) (Table 5). Facility level explained 2.4% of the variance in the total patient safety score; facility level was however not a significant contribution in the final model. All three initiatives made significant contributions to the model. This study is the first using the NHSOPSC instrument in a cross-sectional prospective longitudinal design reporting how a sample of staff in Norwegian nursing homes perceive patient safety culture over time and whether the nursing homes’ own organizational initiatives have an influence on the total patient safety culture score. Variability described by changes in average percent of positive responses and changes in mean scores per safety culture dimension from baseline to follow-up demonstrated a high degree of stability at the group level (all nine nursing homes). We found that eight out of 10 patient safety culture dimensions had an average score of more than 60% positive responses in both the baseline and follow-up surveys (Table 3), which is regarded a good score and might indicate a lower risk of adverse events . In the period of this study (2013–2015), the implementation of the Coordination Reform placed pressure on the nursing homes as the responsibility for medical treatment and advanced care was transferred from hospitals to nursing homes, further reinforced by financial incentives. Judging from the stability of our results, the reform has not had a negative effect on the results of the follow-up measurement in 2015. The ongoing National Patient Safety Program with its focus and activities directed towards nursing homes might have contributed positively to the stability of the patient safety culture . Improving and sustaining a positive safety culture during periods of budget cuts and downscaling of beds, while at the same time caring for more acute and complex patients should definitely be seen as a challenge for the current nursing homes. The high degree of stability at the group level (all nine nursing homes) may be explained by the high scores of positive responses on the safety culture dimensions “supervisor expectations and actions promoting patient safety” and “feedback and communication about incidents” in both the baseline and follow-up surveys. These results may furthermore indicate that supervisors have been able to sustain staffs confidence in patient safety issues during the demanding reform period. Extensive research has recognized that leadership commitment is a critical factor and one of the most frequently cited safety culture dimensions [37–39]. Supervisors can create and support an environment in which the staff feel responsible for ensuring that patients are safe by improving communication and participation in decision-making . The patient safety culture dimensions of “staffing” and “training and skills” had the lowest scores both in the baseline and at follow-up surveys and this stability is of major concern. Recent Norwegian reports relate the challenges of resources and competencies to the implications of the Coordination Reform [29, 40, 41]. When comparing changes in mean scores for the total patient safety culture score at the group level (all nursing homes), we found no significant differences between the baseline and follow-up. At the facility level (single nursing homes), we found a significant change between the baseline and the follow-up for one nursing home (NH6), indicating initiatives have been initiated at a local level in the period. The present study suggests that the predictive value of nursing homes’ own organizational initiatives explained 29.5% of the variance in the total patient safety score. The 2.4% effect of the facility level was not significant when “own organizational initiatives” was entered into the regression model. This indicates that the differences between the nursing homes were mainly due to their own initiatives. Further, the nursing home that had a significantly higher total patient safety culture score during the follow-up (NH6) also had the highest scores regarding organizational initiatives. These findings indicate that the initiatives of nursing homes that can be tailored to local needs influence the perception of the total patient safety culture score positively. This emphasizes the importance of managers facilitating staff participation in decision-making and supporting staff responsibility for patient safety initiatives . The organizational initiative “In this nursing home, we have been offered training to improve patient safety over the last year” had low scores. This is of concern and may mirror the continued low scores on the safety culture dimension “training and skills” at follow-up. To sustain and improve patient safety culture over time, the findings may indicate that patient safety initiatives should be anchored within the current nursing home at an organizational level, and include both generic interventions like targeted areas of the National Patient Safety Program (e.g., safety in medication use and fall prevention) and local tailored initiatives [26, 32] as exemplified by the nursing home NH6. A strength of this study is the response rate of 70% to the baseline survey and 69% to the follow-up, which can be explained by the local leadership involvement and feedback meetings at each participating nursing home. Another strength is the high number of respondents working directly with patients (including day, afternoon, and night shifts) providing important knowledge of the frontline staff perceptions of patient safety culture as managers often have more positive safety culture perceptions [42, 43]. To ensure that respondents felt comfortable reporting their opinions and to ensure that their responses could not be tracked back to them, individual identifiers were not applied. This is in line with the recommendations of the NHSOPSC User Guide. Therefore, the staff samples are not identical between the baseline and follow-up surveys and this is addressed in the statistical analyses by using independent samples t-tests. Nine nursing homes located in the southern region of Norway were included in the study based on their interest in patient safety issues. Although our study results are not necessarily generalizable to all nursing homes in Norway, they provide a valuable overview of the variability over time in a cross-sectional sample of Norwegian nursing homes. An important limitation is the lack of data on standardized objective outcome measures for Norwegian nursing homes (e.g., urinary infections and medication-related events). Further, we are aware that NHSOPSC is designed to assess staff’s subjective perceptions of patient safety culture at a given point in time and therefore does not describe a complete “picture” of patient safety culture. Nevertheless, we feel that a subjective assessment provide valuable information on how patient safety culture is viewed by frontline nursing home staff. Variability measured by changes in average percentage of positive responses and mean scores per safety culture dimension from baseline to follow-up showed a high degree of stability at the group level (all nursing homes) in a sample of Norwegian nursing homes, and we found no significant difference between the baseline and the follow-up. A significant improvement of the total patient safety culture score between the baseline and the follow-up surveys was found for one of the nursing homes (NH6) which also had the highest scores pertaining to its own organizational initiatives. The nursing homes’ own organizational initiatives explained 29.5% of the variance of staff perceptions of the total patient safety culture score. This indicates that organizational initiatives tailored to local needs are predictors for patient safety culture. Patient safety initiatives should be anchored within the current nursing homes at an organizational level and include both generic interventions like targeted areas of the National Patient Safety Program and local tailored initiatives. Future research should develop valid outcomes that measure patient safety in the nursing home setting, as well as studying the role of leadership and staff involvement in more detail related to nursing homes’ own patient safety initiatives. The authors would like to thank the management and staff of the participating nursing homes for their assistance in collection of data and Nina Konglevoll for technical assistance. The study received funding from the Norwegian Nurses Organization. The funder had no part in the design of the study, the collection, analysis, and interpretation of data, or in writing the manuscript. The datasets analyzed in the present study are available on request from the corresponding author. Data are stored at Uni Research Health, Uni Research, NORCE Norwegian Research Centre AS, Bergen. KC was responsible for designing the study, developing the Norwegian version of the NHSOPSC, data collection, statistical analysis in SPSS, the interpretation of data, and writing of the first draft of the manuscript. AH performed the Mplus analyses and contributed to the interpretation of the data and the revision of the manuscript. KA supervised the design of the study, contributed to the interpretation of data, and critically revised the manuscript. All authors read and approved the final manuscript. Kathrine Cappelen, RN, Cand. polit., Assistant professor, Centre for Caring Research South, Faculty of Health and Social Science, University of South-Eastern Norway. Research interests: Patient safety and leadership. Anette Harris, PhD in Psychology, Professor at the Department of Psychosocial Science, Faculty of Psychology, University of Bergen, Norway. Research interests: Work psychology. Karina Aase, PhD in Work Environment and Safety, Professor and Centre Director at SHARE - Centre for Resilience in Healthcare, Faculty of Health Sciences, University of Stavanger, Norway. Research interests: Patient safety, organizational/cultural factors, transitional care, resilience in healthcare. The study was approved by the Norwegian Centre for Research Data (Ref. No. 2012/32450). Participation was based on written informed consent. Simmons S, Schnelle J, Slagle J, Sathe NA, Stevenson D, Carlo M, McPheeters ML. Resident safety practices in nursing home settings. Effective Health Care Program, Technical Brief No. 24 (Prepared by Vanderbilt Evidence-based Practice Center under Contract No. 290-2015-00003-I). Agency for Healthcare Research and Quality: AHRQ Publication No 16-EHC022-EF. Rockville, 2016. www.effectivehealthcare.ahrq.gov/reports/final.cfm. Olsen RM, Devik SA. Patient safety in medication use (Legemiddelbruk og pasientsikkerhet) 2016. http://www.helsebiblioteket.no/omsorgsbiblioteket/nyheter-og-aktuelt/legemiddelbruk-og-pasientsikkerhet-sammendrag-pa-engelsk. Accessed 6 Sept 2017. Olsen RM, Mentsen T, Devik SAN. Falls and patient safety (Fall og pasientsikkerhet blant eldre i kommunene) 2017. http://www.helsebiblioteket.no/256607/fall-og-pasientsikkerhet-sammendrag-pa-engelsk. Accessed 6 Sept 2017. El-Jardali F, Dimassi H, Jamal D, Jaafar M, Hemadeh N. Predictors and outcomes of patient safety culture in hospitals. BMC Health Serv Res. 2011;11 https://doi.org/10.1186/1472-6963-11-45. Report to Parliament No. 47 (2008-2009). The Coordination Reform: Proper treatment - at the right place and right time. https://www.regjeringen.no/contentassets/d4f0e16ad32e4bbd8d8ab5c21445a5dc/no/pdfs/stm200820090047000dddpdfs.pdf. Accessed 6 Sept 2017. Evaluering av samhandlingsreformen, EVASAM (Evaluation of the Coordination Reform). Prepared by the Research Council Norway for the Ministry of Health and Care Services, Oslo, 2016. https://docplayer.me/29892744-Evaluering-av-samhandlingsreformen-sluttrapport-fra-styringsgruppen-forforskningsbasert-folgeevaluering-av-samhandlingsreformen-evasam.html. Accessed 6 Sept 2017. Gautun, H. and Syse, A. The Coordination Reform. How do Community Health Services Receive the Increased Amount of Patients Submitted from Hospitals? NOVA—Norwegian Social Research 2013. In: Report Oslo, NOVA - Norwegian Social Research 2013-2014. [In Norwegian] http://www.hioa.no/Om-HiOA/Senter-for-velferds-og-arbeidslivsforskning/NOVA/Publikasjonar/Rapporter/2013/Samhandlingsreformen. Accessed 6 Sept 2017. Samhandlingsstatistikk 2013–2014. Helsedirektoratet, 2015. https://helsedirektoratet.no/Lists/Publikasjoner/Attachments/798/Samhandlingsstatistikk-2013-2014-IS-2245.pdf. Accessed 6 Sept 2017. Brurvik F, Drageset J, Abrahamsen JF. From hospitals to nursing homes - the consequences of the Care Coordination Reform. Sykepleien Forskning, 2017. In: Sykepleien.no/ Forskning https://doi.org/10.4220/Sykepleienf.2017.60613. National Patient Safety Programme, 2018. In: http://www.pasientsikkerhetsprogrammet.no. Accessed 6 Sept 2017. Sorra J, Gray L, Franklin M, Streagle S, Tesler R, Vithidkul A. Action Planning Tool for the AHRQ Surveys on Patient Safety Culture. (Prepared by Westat, Rockville, MD, under Contract No. HHSA290201300003C). Agency fpr Healthcare Research and Quality: AHRQ Publication No. 16-0008-EF, 2016. https://www.ahrq.gov/sites/default/files/wysiwyg/professionals/quality-patientsafety/patientsafetyculture/planningtool.pdf. Accessed 6 Sept 2017. Sorra J, Gray L, Famolaro T, Yount N, Behm J. AHRQ Nursing Home Survey on Patient Safety Culture: User's Guide. (prepared by Westat, Rockville, MD under Contract No. HHSA290201300003C. Agency for Healthcare Research and Quality: AHRQ Publication No 15(16)-0052-EF, replaces 08(09)-0060, 2016. https://www.ahrq.gov/sites/default/files/wysiwyg/professionals/quality-patientsafety/patientsafetyculture/nursing-home/nhguide/nhguide.pdf. Accessed 6 Sept 2017. Haukelien H, Vike H, Vardheim I: Samhandlingsreformens konsekvenser i de kommunale helse- ogomsorgstjenestene. In: TF-rapport nr 362. Bø: Telemarksforskning; 2015. https://brage.bibsys.no/xmlui/handle/11250/2486637. Accessed 6 Sept 2017.